The Sacagawea Dollar was first made in 2000 and was the first circulating U.S. coin to feature an identifiable Native American. It features Sacagawea, the Native American guide for the 1804-1806 Lewis and Clark Expedition that found an overland route to the Pacific and therefore opened the America West to exploration and settlement. The reverse of the coin features an American eagle in flight, as well as 17 stars to symbolize the 17 states in the Union at the time of Sacagawea’s journey with the Lewis and Clark Expedition. Unlike all other coins in circulation, the Sacagawea Dollar was made in a unique golden alloy to make it easily distinguishable from other coins. The coin also has a smooth edge, unlike previous dollar coins that have reeded edges. 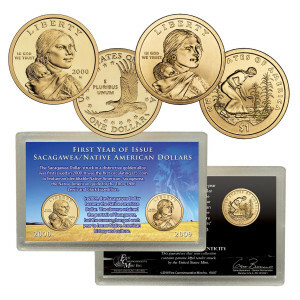 In 2009, the Sacagawea Dollar was replaced with the Native American Dollar. The obverse of the Native American Dollar retained the portrait of Sacagawea, but the reverse changed each year to honor a different aspect of Native American history and culture. In addition, the mint mark and other inscriptions were moved to the edge. The one-time-only 2009 Native American Dollar features the “Three Sisters” method of planting that allowed Native Americans to grow food efficiently. It depicts a Native American woman planting seeds. This collection includes the first-year 2000 Sacagawea Dollar and the first-year 2009 Native American Dollar. Both coins are in Uncirculated condition, as issued by the U.S. Mint.The coins have been unavailable from the U.S. Mint since the respective years of issue.